Russian President Vladimir Putin prefers Ethereum over Bitcoin because Ethereum has an organization staffed by humans running it, and that means that there is an attack vector for Putin's intelligence agencies to influence and manipulate. Never forget that Vladimir Putin is a spook. His priority is the ascendance of the Russian state. Bitcoin has no such organization. Nobody owns Bitcoin. Just those who use it. That makes Bitcoin immune to such shenanigans by governments. This also makes Bitcoin an existential threat to the global central banking paradigm. Ethereum on the other hand has an organization running it, and Ethereum is not capped in the same way that Bitcoin is. 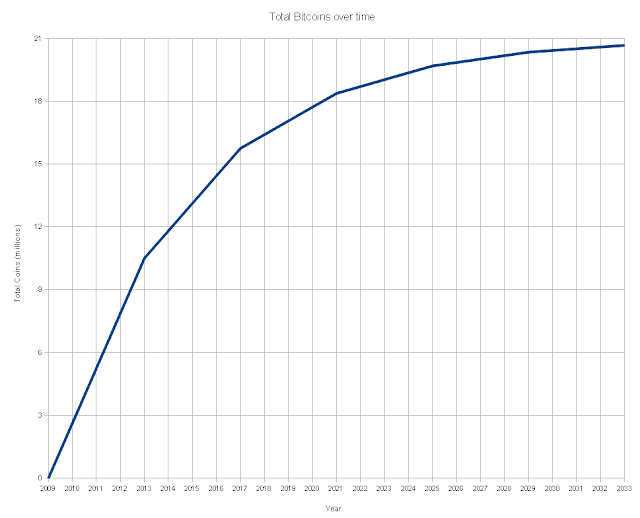 This graph is borrowed from a discussion on bitcoin.stackexchange.com. All rights reserved. We know that there will never be more than 21 million Bitcoins mined. That limit is hard coded into the software. The software is open source, so anyone with adequate code skills can step through it and see how it works, and see why the cap exists. As Artefact2 mentioned, Bitcoin uses fixed-point math to calculate the block subsidies. So, ignoring the unspendable genesis block, the sundry lost coins and unclaimed rewards, the maximum number of bitcoins is 20999999.9769 BTC. 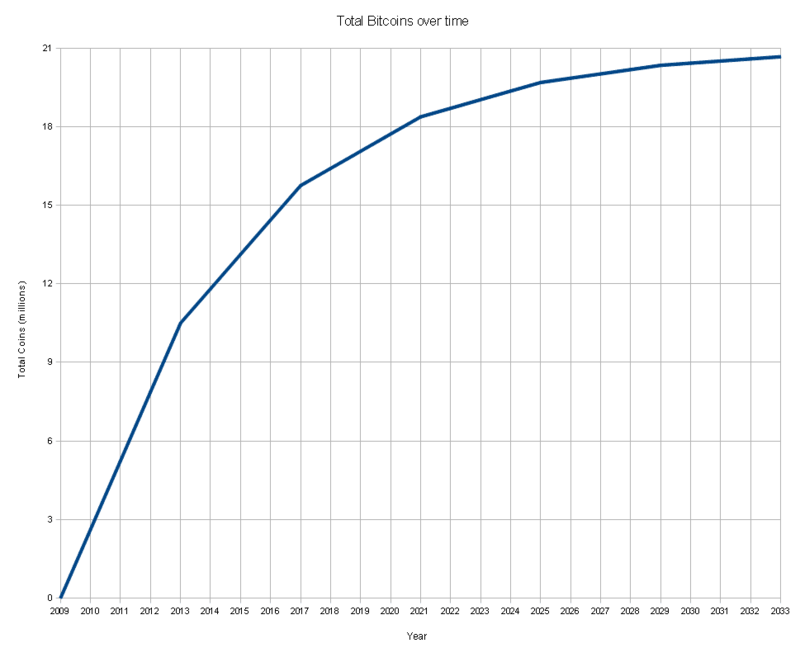 Of course, it only differs from 21 million BTC by only 3 bitcents, so the difference isn't significant. Ethereum on the other hand is not capped, because Ethereum is used for various purposes like "smart contracts" by design and it must be replenished from time to time. Ethereum is more accurately understood as a platform, and it is undeniably useful, but when considering Ethereum as a currency, its lack of a cap constitutes a fatal flaw. The fact that Ethereum is not capped makes it just a better fiat currency. Ethereum advocates insist that Ethereum is not a currency at all, but Ethereum is traded on cryptocurrency exchanges, so millions of investors consider it a cryptocurrency, whether its creators intended that or not. Ethereum is hence a de facto digital fiat currency, with many advantages over traditional fiat currencies issued by governments, but it is a fiat currency. By definition, fiat currencies are backed by governments under our current system of global central banks. Ethereum is controlled by the Ethereum Foundation and Ethereum.org. Ethereum is in all other respects a de facto fiat currency, differing only in that no government controls it, so far, and as far as we know. Any money declared by a government to be legal tender. State-issued money which is neither convertible by law to any other thing, nor fixed in value in terms of any objective standard. Intrinsically valueless money used as money because of government decree. Bitcoin is also a fiat currency, because it is backed by nothing but our willingness to transact with it and accept it for payments, but it is capped at 21 million Bitcoins, all of which are expected to be mined around the year 2140. Because Bitcoin is divisible out to eight decimal places, it is like digital gold. Bitcoin will simply rise in value. I think that it is nice that Vladimir Putin likes Ethereum. I also think that there is money to be made speculating on Ethereum. As a longterm store of value, as a safe haven asset, however, Bitcoin remains not just the first cryptocurrency, it remains the simplest, and the best.